Here’s another recipe from Super Natural Cooking: Five Ways To Incorporate Whole and Natural Ingredients into Your Cooking : this one a cold noodle salad with a spicy dressing and browned tofu. We got impatient for dinner and didn’t brown the tofu as long as recommended, but it was delicious nonetheless. Leftovers were great the next day. Keep them cool — heating them up will make the noodles and tofu mushy. Wait; but you’re the one who cooked! Yeah, I just didn’t realize this was a cold dish. I’m sure it’ll be good. Oooh… that sauce is a little spicy! Yum, yeah it is! There’s a little kick there. It’s really good. So what do you think about the fact that it’s cold? Well I thought it would be weird, but I actually really like it. 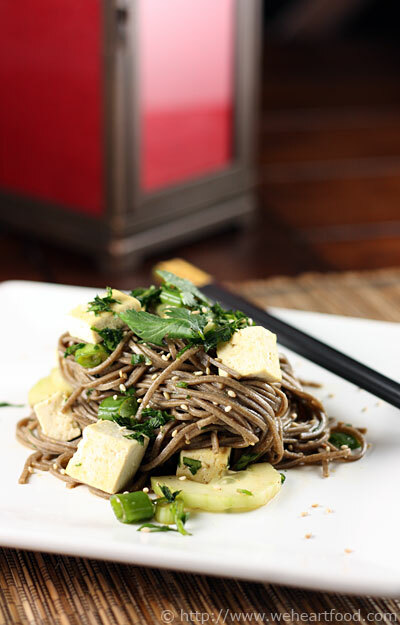 The buckwheat noodles rule. Ditto. I think we could have cooked the tofu a little more, but other than that it’s pretty awesome. Let’s make this again for sure! Make the dressing by combining the zest, ginger, honey, cayenne, and salt in a food processor and process until smooth. Add the lemon juice, rice vinegar, and soy sauce, and pulse to combine. With the machine running, drizzle in the oils. While the pasta is cooking, drain the tofu, pat it dry, and cut it into cubes. Cook the tofu in a dry nonstick (or well-seasoned) skillet over medium-high heat for a few minutes, until the pieces are browned on one side. Toss gently once or twice, then continue cooking for another minute or so, until the tofu is firm, golden, and bouncy. This entry was posted on Friday, February 13th, 2009 at 12:15 am	and is filed under Asian, Main Dishes, Super Natural Cooking, Vegetarian. You can follow any responses to this entry through the RSS 2.0 feed. You can leave a response, or trackback from your own site.